A restaurant is a place where food is prepared, drink and and served to customers in return for money. Meals are generally served and eaten on premises, but many restaurants also offer take-out and food delivery services. Restaurants vary greatly in appearance and offerings, including a wide variety of the main chef's cuisines and service models. 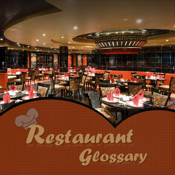 This Glossary is an easy to use application with comprehensive list of terms related to day-to-day activity in Restaurant with a comprehensive terminologies . Get acquainted with this terminology for better Restaurant Management.